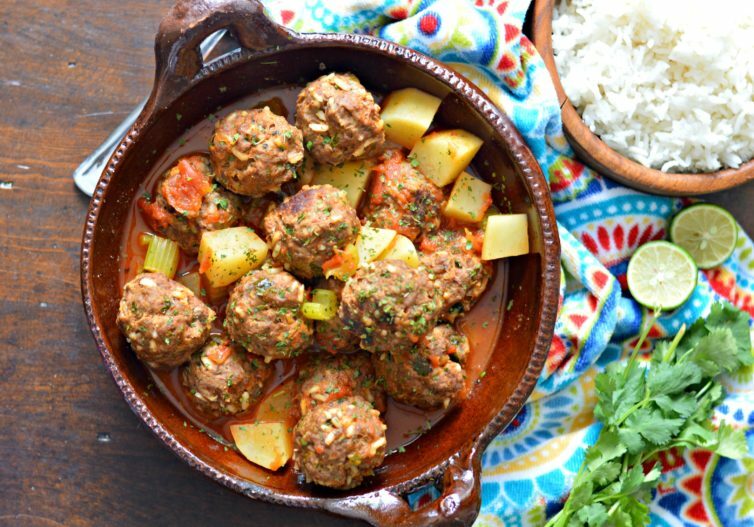 Inside: Find out how to make these delicious, easy to make, Mexican meatballs, known as “albondigas” in Spanish. 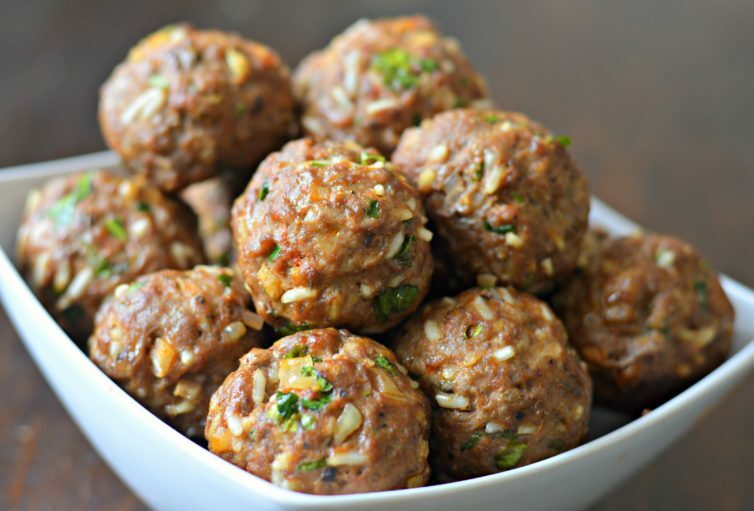 The meatballs recipe that I am going to share today is much different from the Italian meatballs that you are probably used to, and which are also delicious. If you are looking for a more traditional meatball, check out this one made with ground bison and cheese. There is nothing like eating a homemade meal made by mom. Without a doubt, it is one of my favorite memories from growing up and as time goes by, I have realized how important those moments were. There is just something about a home cooked meal that makes it so delicious. Maybe it is being able to enjoy with family, or the love that it is made with, or maybe just simply having fresh ingredients. Whatever it is, I think we can all agree that home cooked meals are best. Some of my favorite memories are when I spent time in the kitchen with my mom or my abuela. Through them, I learned the art of cooking, and they and their delicious recipes are the inspiration behind my website. 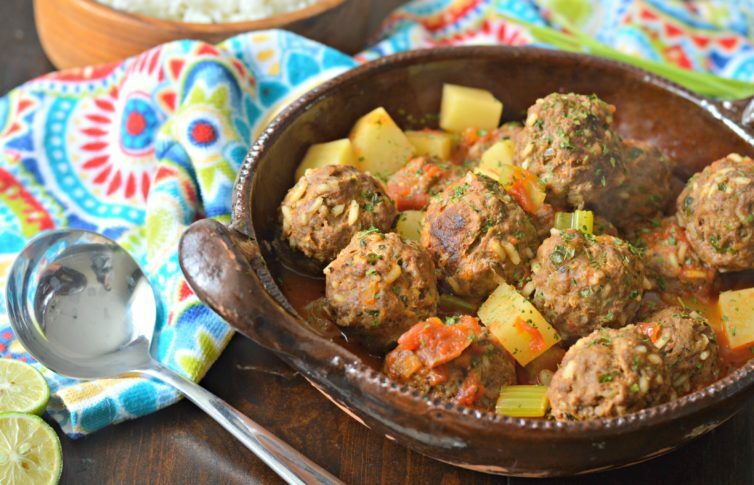 The best part for me was to pull up a tall stool and sit next to them to form the meatballs (or albondigas) for this recipe. 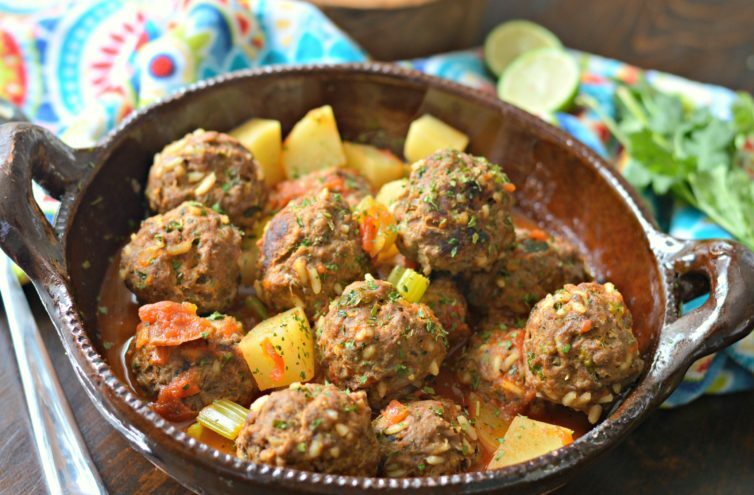 It was always so much fun and I also was able to learn how to make these Mexican meatballs. My abuela always took advantage of those times to share stories from her youth. I listened closely while carefully trying to make perfectly shaped meatballs (although they usually ended up looking more like a sausage than a ball!). All of those years of practice helped me perfect this recipe that I am going to share today. 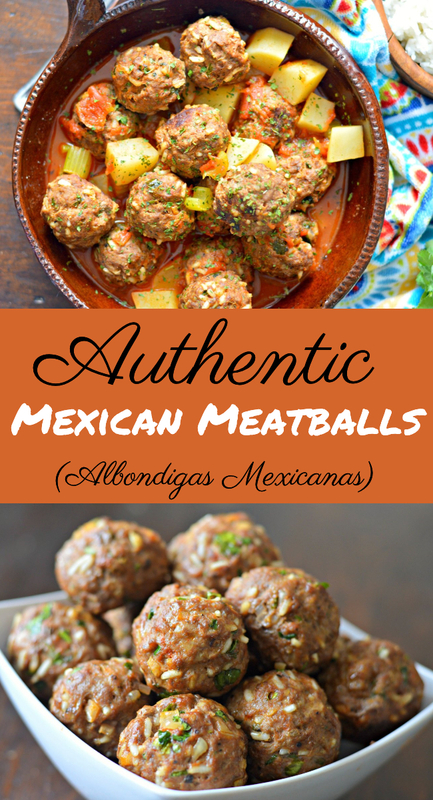 My recipe for Mexican meatballs, or albondigas Mexicanas, are made with a combination of beef and pork. The meat is then mixed with a variety of seasonings and white rice and then cooked in a tomato-chipotle salsa. The meatballs are cooked in the salsa along with potatoes, carrots, and/or squash. Today, I just used potatoes, because it is a vegetable that my kids enjoy. You then serve it with white rice or beans, and of course, like most Mexican food, with tortillas. What is the difference between Mexican Meatballs and Italian Meatballs? In my opinion, both Mexican meatballs and Italian meatballs are delicious. The main difference is really the type of spices and seasonings that are added. 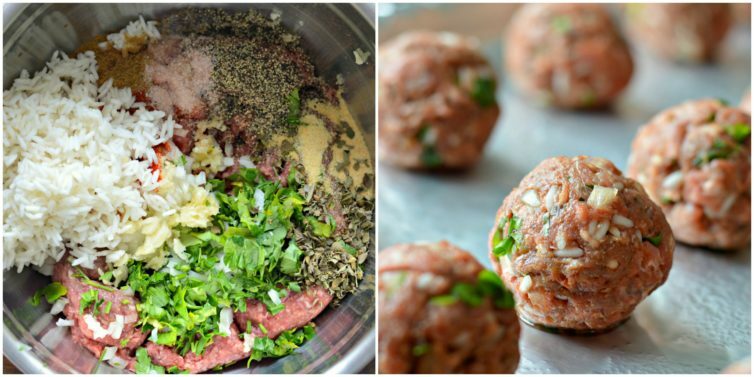 For example, for Italian meatballs, you will use herbs such as basil to season it, while for Mexican meatballs, you will use parsley. The other difference is that instead of a marinara, for Mexican meatballs, you will serve the meatballs with a chipotle salsa that gives it that distinctive Mexican flavor. Italian meatballs are usually considered more sophisticated, while Mexican meatballs are definitely a comfort food. The other difference is that Mexican meatballs are cooked with vegetables. 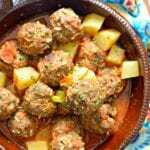 Since you serve these meatballs as a soup, they are also known sometimes as Mexican meatball soup. They can also be served as an appetizer before the main dish at local restaurants. That said, it can also be served as a main dish accompanied by rice and tortillas. This is usually served for lunch, which tends to be the biggest meal of the day in Mexico. That is different from the United States where dinner is usually the biggest meal. You are going to love this recipe. Don’t miss out and let me know how it turns out below. A good standard Blender or an immersion blender. Baking sheets for cooking the meatballs. 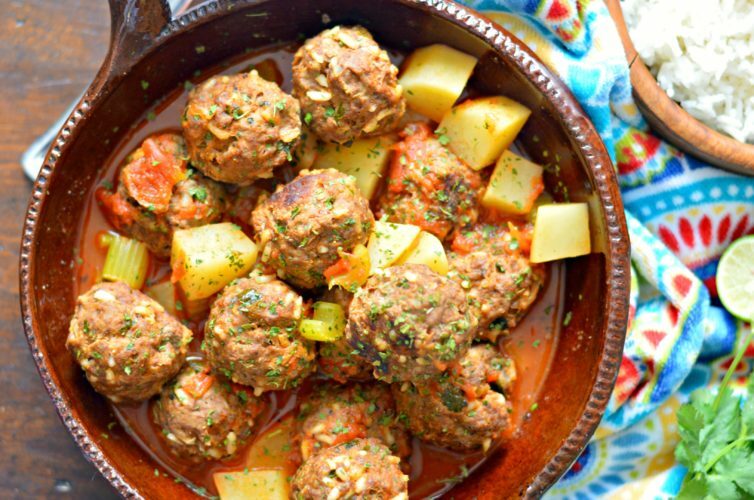 Find out how to make these delicious, easy to make, Mexican meatballs, known as "albondigas" in Spanish. Start by adding the 1/2 cup of white rice to a pan with 1/2 cup of water and let boil for 10 minutes to partially cook the rice. Let cool and set aside. Add all of the meatball ingredients, including the rice, in a large bowl and mix well. Once combined, form balls that are approximately 1 inch in diameter, and place on a baking sheet. Bake at 400 degrees Fahrenheit for about 15 minutes or until sufficiently browned on the outside. Separately, blend the ingredients for the salsa in a blender, and then saute the salsa with 1 tsp of olive oil over medium-high heat. Add the potatoes and let boil for approximately 5 minutes. Add the celery and the cooked meatballs. Add additional salt and pepper to taste and let simmer for approximately 20 minutes longer until the meatballs and potatoes are completely cooked through. Accompany with rice, beans, and tortillas.